Or so we were told by a famous sports company back in the day. Whatever ‘it’ was. If there’s one lesson I’ve learnt since having child with additional needs it’s that we don’t just do anything. There’s the big stuff. Learning to sit, crawl, stand, walk, talk, and in Hazel’s case especially, learning to feed. We follow a different time-scale to most. I have an early, painful memory of being handed Hazel’s little red book by a well -meaning nurse, only for her to return shortly afterwards and abruptly pull out the growth charts, replacing them with a special set – exclusively for children with Down’s syndrome. My already fragile and hurt feelings were then compounded by a visit from the audiologist who was doing the rounds in the tiny NICU room we were in. I overheard her speech as she went from cot to cot, parent to parent, explaining the routine hearing test their babies would soon be having and how they would probably have nothing to worry about. The tilt of her head did nothing to prepare me for her words. Delivered with a gentle brutality as to send me reeling. “Of course, your baby might not pass this test”. I wasn’t prepared. I wasn’t ready to be different. Going to the park. Getting a babysitter and going out for an evening. We need a nurse for that. Dropping in on friends or taking a day trip. The cinema, theatre or pantomime, zoos, farm parks, play areas. Even a simple picnic in the sunshine. Concerns about sensory issues and how Hazel will react. Changing facilities (or lack of them); all these factors add up and quite honestly often put us off setting foot outside out home. Hazel’s feeding equipment, routines and reactions make these things harder. Not impossible, but harder. Even the things we do “do” take far more planning than we would like. Going to Church, a trip round the supermarket, a children’s party, lunch with friends or family. Sometimes it’s easier not to even attempt these things. And, if I could change this, I would. In a flash. Of course I would. Who wouldn’t? The truth is we can do many of these things, but the word “just” has to be firmly kicked into the long grass. When you “just do” something you may miss the complexities of how it is done. You may miss the joys of achieving the seemingly impossible. You may take it for granted. But, when you finally “do it”, do the very thing that is so hard for you to do, however easy it might be for others, then the sense of achievement is often beyond measure. The appreciation for what might be a simple pleasure is second to none. It’s in those moments that my heart sings. Today held one such moment. Hazel doesn’t eat. She is 100% tube fed. We try. We try hard to help her to learn. To help her to want to eat. We play, we have fun with food. We get messy. In school it’s called “Food is fun”. But it is hard. So so hard. Hard when the walls, ceiling and anyone else sitting at the table is covered in whatever food Hazel has been “playing but not eating” with. Today it was orange. The colour, that is. Pureed carrot and sweet potato. The clean-up took three times as long as the ‘meal’. It even reached the television which was quite a feat considering that’s in another room entirely. Ah but surely this is quite usual for a child learning to eat, you may think. It’s a phase. Yes. It just doesn’t usually last four years and counting. We clean up, with a heavy heart and an unspoken envy of families where children just pick up a spoon and eat; or who can go off out into the sun with a picnic whenever the mood takes them. It sang at the smiles, laughter and joy Hazel exuded in her state of orangeyness. It sang as she giggled throughout lunchtime, happy to be with us at the table, enjoying the moment and being part of our family. And it sang because, in all the laughter, Hazel actually took two spoonfuls of the vegetable medley in her mouth! So we will continue to embrace the mess. Savouring, relishing in and enjoying the milestones, or even just the stepping stones along the way. Golden moments in time that are hard fought for. One day we will picnic together, all four of us. But I don’t really ever want to “just do” anything. 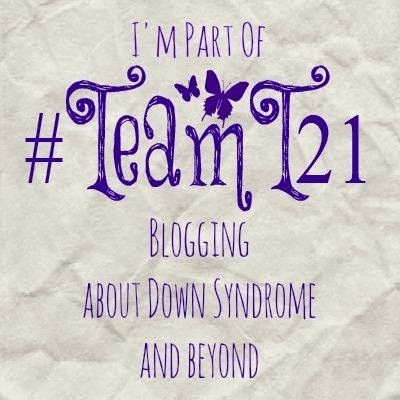 Categories: Down Syndrome, Down's Syndrome, Joy, Trisomy 21, Uncategorized | Tags: #dontscreenusout, #downssyndrome, #downsyndrome, #fearfullyandwonderfullymade, #foodisfun, #picnics, #Team 21, #Trisomy21, joy | Permalink. Is one for word for it….chocolate is another! Yes, it may take longer but you will get there. Will introduce you to a lady who went on a special tube weaning programme with her son.